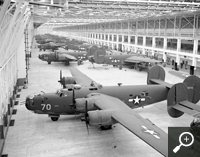 After the Allies' victory, Ford declined to exercise its option to purchase the plant and it eventually was sold to the Kaiser-Frazer Corporation, which produced cars and the C-119 Flying Boxcar there. After years of losses, the company moved its operations to Toledo, Ohio. General Motors Co., Ford's chief rival at the time, began leasing the facility in 1953 and eventually purchased it. Kaiser-Frazer eventually became Kaiser Motors before ceasing operations completely in 1955. GM's last car rolled off the line at Willow Run in 1992. The company's powertrain plant closed in 2010, marking the end of GM's operations there. Most of the plant was demolished by 2015. 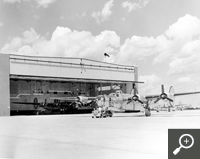 The Yankee Air Museum, which Norton and others founded in 1981 to celebrate the area's rich aviation history, was looking for a new home after its original facility was destroyed by a fire. They reached an agreement with the trust that owns the property to purchase and renovate a small part of the plant and house the museum there. They've been fundraising and getting help from volunteers in the community ever since. That's where Koepp, the IBEW and NECA came in. He knew about his family's history there. His grandfather went on to become a licensed pilot and took young Jeff on flights out of adjoining Willow Run Airport and Ann Arbor Airport as a child. A.F. Smith was one of the signatory contractors used during the demolition, where Koepp had a chance to meet Norton and learn about some of the critical needs for the museum. One of those was arranging temporary power in the small part of the plant still standing. 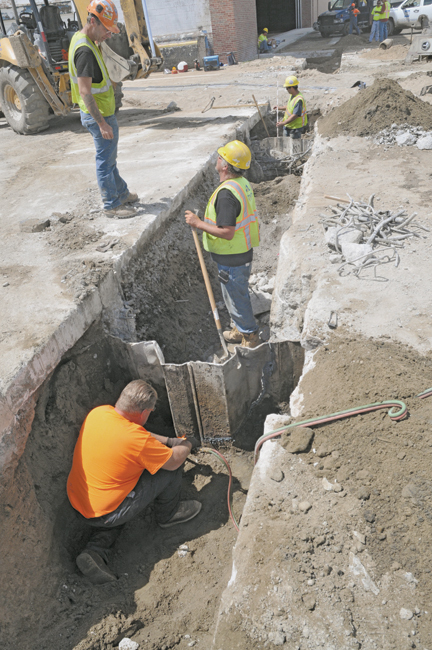 Koepp found an old pump house about 1,000 feet away that was capable of generating 480 volts. In 2015, Local 252 members donated about $25,000 worth of labor to connect it with the museum, allowing renovations to begin. A.F. Smith supplied an 800-amp main distribution panel, four 225-amp lighting panels, four 75-kva transformers and four 225-amp branch power panels to run the temporary lighting. "That was a big, big job," Norton said. "We had no transformers and no connection. Lines had to be strung to put up temporary lights just so we could operate." Local 252 Business Manager Ryan Husse said renovating the museum doesn't just honor the aviation history there; it also honors the IBEW's and Local 252's history. 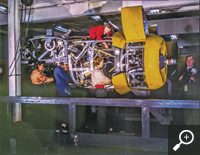 Wiremen were employed as electricians at Willow Run throughout GM's ownership of it. "That place paid a lot of bills for our members," said Husse, noting that most of Local 252's volunteer work began under his predecessor, Tim Hutchins, now on the Sixth District staff, as well as former longtime Business Manager Greg Stephens and now-retired Sixth District International Representative John Briston. Dave Bianco, Local 252's assistant business manager and a longtime business representative, said GM would install a new electrical system whenever it decided to change the model of the automobiles it was producing at the plant. That work was done by Local 252 members — many of whom lived in the adjoining West Willow community alongside members of the United Auto Workers — and travelers from across the country. "We always had a signatory [contractor] in there," Bianco said. "It put a lot of people to work." Koepp said suppliers have stepped up to donate cable and lighting. 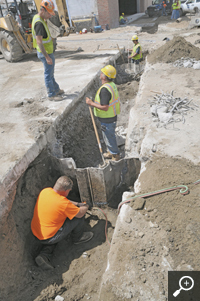 Local 252 members have installed it, much of it on a volunteer basis. He arranged a deal with Square D, a company that manufactures switch gear, to have a switchboard delivered in just 13 weeks — about half the usual time, and Square D donated half the cost. That result was a 3,000-amp main electrical switchboard at a bargain price. Local 252 has committed to donating at least $25,000 in labor this year, which is a critical one for the museum. That's because a new, more immediate challenge has surfaced. 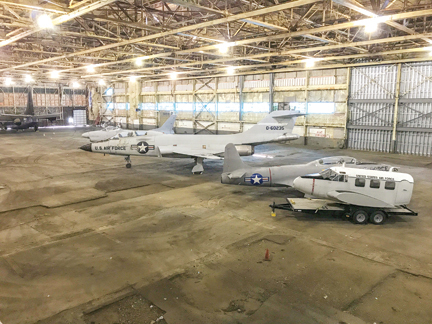 Willow Run Airport officials informed the museum in mid-2018 that it could no longer use the hangar where it stored its planes, which include a B-17, B-25 and C-47, because it needed the space for its own operations. Many of the aircraft remain in use and public flights are available. 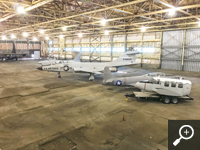 Museum officials must vacate the hangar by the end of this year. 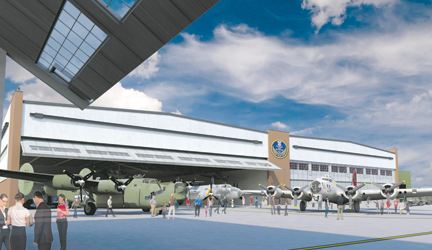 A drive to raise an additional $6 million to build a new hangar to store the historic planes is ongoing. Donations can be made at savethebomberplant.org. "This was a major blow," Koepp said. "That really changed things up on us. We've got to come up with a place to store and move these flyables to." Local 252 has led the way for the IBEW, but it hasn't been alone. Detroit Local 58 and other local unions in the state also have pitched in to help. Work is expected to continue on the museum for the next several years. More information is available at yankeeairmuseum.org. Norton said he's grateful for the help of the IBEW and other unions in the area. Without them, preserving a critical part of the nation's World War II history would have been difficult. "There's been nothing like Willow Run before or since," he said. 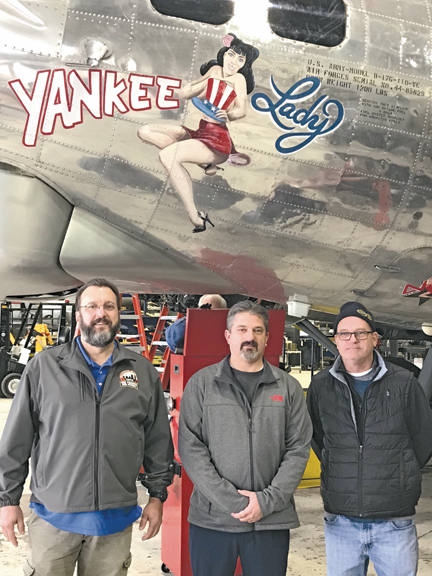 With help from IBEW members, the Yankee Air Museum in Ypsilanti, Mich., will preserve part of the iconic Willow Run B-24 bomber factory, which played a pivotal role in winning WWII and helped create the legend of "Rosie the Riveter." 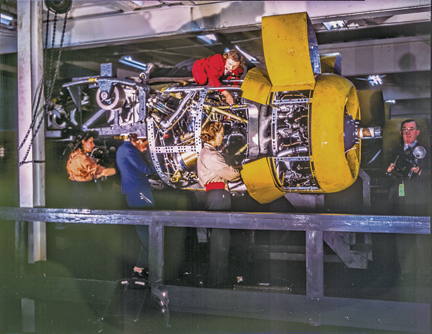 Photos provided by Yankee Air Museum. 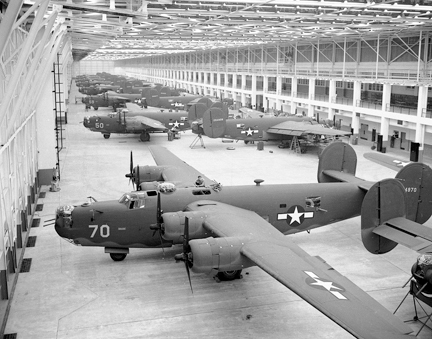 The Willow Run Bomber Plant was rolling one B-24 bomber off its assembly line every hour in 1944. Photo provided by Yankee Air Museum. 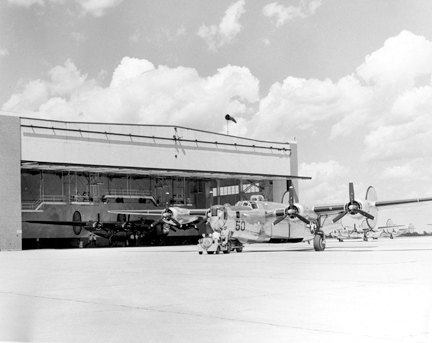 The Yankee Air Museum houses the B-24 and other planes used by American forces during World War II. Top photo provided by Yankee Air Museum. 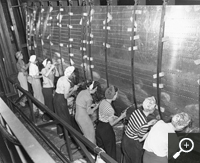 Female workers at the Willow Run Bomber Plant install the engine inside a B-24 during World War II. 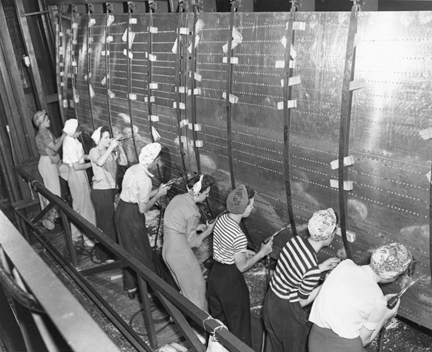 Some historians think these women inspired the iconic "Rosie the Riveter" poster. IBEW members and signatory contractor A.F. Smith Electric have donated time and money to the museum. 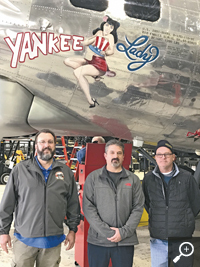 From left, Ann Arbor, Mich., Local 252 business agent Rick Plisko, Business Manager Ryan Husse and assistant business manager Dave Bianco during a recent visit to the Yankee Air Museum.